In an effort to expand their capabilities to address various unique and challenging rotor balancing issues, Acme Armature Works Inc. 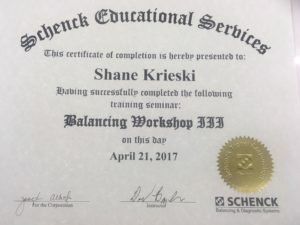 Owner Chad Bahrs and Service Technician Shane Krieski completed a Schenck Educational Services Rotor Balancing Workshop III training seminar in Chicago, Ill. on April 21, 2017. The day-long workshop was presented in an open-forum format, during which participants could review basic electric motor balancing principles, improve rotor balancing skills and address specific application challenges. 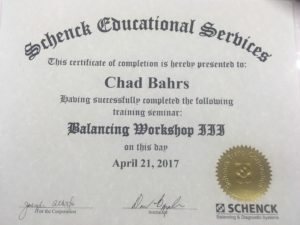 According to Bahrs, the seminar placed a heavy emphasis on specialized cases. 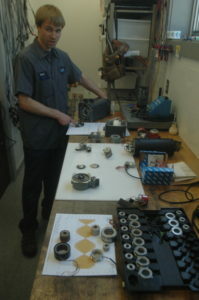 The workshop gave Bahrs a valuable opportunity to gain additional knowledge based on the experiences of other repair technicians in the electric motor repair field. Bahrs is eager to pass along the concepts learned during the workshop to better assist Acme’s loyal and expanding customer base.